The URI associated with this bug is an image of a graph of the memory consumption of all major browsers rendering the same scene with the same settings. Horizontal axis is in seconds. During a rendering the memory usage in FF rises rapidly with allocations sometimes exceeding 100MB a second. If the render completes before the 2GB wall is hit, the browser doesn't crash but if the target resolution is increased or the model is more highly detailed, the 2GB wall can be hit before rendering is done. Once this happens, the browser will almost certainly crash (though it may take a minute or two). 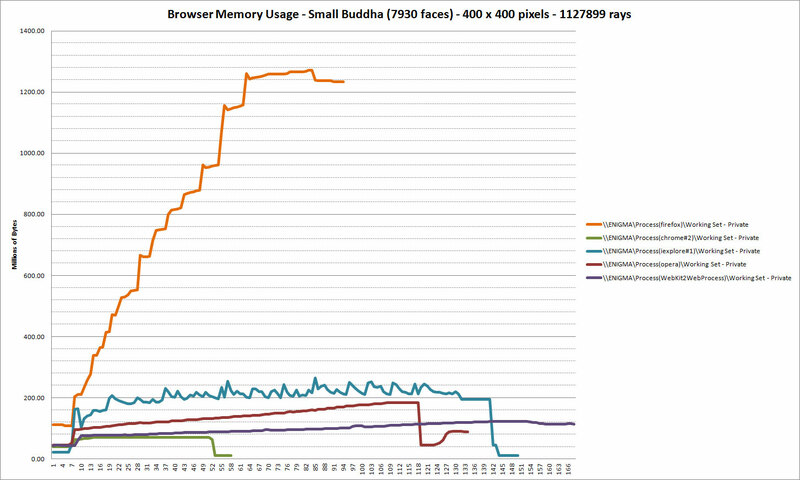 Also note the drop-off in memory after rendering at the end of most of the graphs. I shift-reloaded the tabs a few seconds after the rendering completed to show another problem I am having. Reloading the tab and then redoing a rendering often crashes the browser very quickly because the previously used memory is not freed nor reused. render_buddha.html - Is similar to the scene that produced the graph. render_bunny.html - Shows that increased model complexity causes an out of memory condition to occur somewhat earlier. Jon-Carlos, are you able to get the output of about:memory (just cut and paste) before it crashes? Those are some ugly numbers. I wonder why js-main-runtime-gc-heap-committed-unused is so high? This is wasted space caused by partially full 4KB arenas. This is wasted space caused by partially full 1MB chunks. How can so much fragmentation occur within a single compartment? Something seems badly wrong. 1) In Chrome (32bit), this scene consumes about ~160MB to render. 2) Unlike the previous 32-bit runs, about:memory report didn't _always_ display the bulk of the memory in "unused" categories. Sometimes the memory dump showed ~2.5gb of non-function objects (see below). But a reload would show something similar to above. The memory seemed to fluctuate from fully utilized to mostly unused throughout the course of the render. > utilized to mostly unused throughout the course of the render. Ah, that's a good clue. So it sounds like Firefox is creating vast numbers of objects that die in groups, or something like that. Apart from the huge amount of unused space on the heap, there's also lots of non-function objects kept alive during and after the rendering. So it looks like the heap is very fragmented, explaining why this much memory is wasted. Another question altogether is why Firefox holds onto that much more objects than the other browsers. Maybe there's some engine-specific code in the application that causes it to hold onto these objects in SpiderMonkey only? > that causes it to hold onto these objects in SpiderMonkey only? There is only one place that ever checks the user agent and that is after a tile has rendered and we determine if there is window.postMessage support and, if so, we use that to schedule the next tile instead of a setTimeout. Any hot code (mostly creating Vectors, Triangles' intersect() function, and the BIH's traversal) is the same between browsers. > the BIH's traversal) is the same between browsers. The key quote:  "Also, avoid vector objects if at all possible (as in vector2 with x and y properties). While again it may be convenient to have functions return these objects so they can change or return both values at once, you can easily end up with hundreds of these created every frame, resulting in terrible GC performance." This doesn't excuse Firefox's bad behaviour here, but it's good JS advice in general. The most likely answer would be "because we run GC too rarely", no? > The most likely answer would be "because we run GC too rarely", no? We run lots of GCs during a rendering. Unfortunately, neither those, nor using "Minimize Memory Usage" on about:memory frees all of these objects. The stats in comment 6 show that even after rendering has finished, there's still 256MB of non-function objects kept live. My guess would be that the second set of stats describes a pre-GC state of things, where all of that memory is in fact used by temporarily-created objects, whereas the first set describes a post-GC state. My thinking is that because 256MB is way more than Chrome ever uses, there must be something causing us to hold onto all these objects but doesn't cause other engines to do so. Hmm. Which builds are we testing here? Any closures involved that close over objects but don't actually use them? I tested with yesterday's Nightly, but it appears to be a longer-standing problem. Hence, I doubt that it's caused by bug 659577, if that's what you're getting at. No, I'm thinking about other changes in the somewhat recent past (last few months) that got rid of some of our closure types (null closures? flat closures? something else?) that changed when closures would actually keep things alive. How long-standing is the issue? I think you are thinking of bug 730497, which landed in 14. So I tested some older versions: about:memory in FF 8 shows pretty much the same situation as the current Nightly does. I gave up on testing older versions after that, but for completeness' sake, I tested in 3.6, too: Memory usage is almost exactly the same, there. > > that causes it to hold onto these objects in SpiderMonkey only? > and, if so, we use that to schedule the next tile instead of a setTimeout. Are you sure about that regarding all of the libraries you're using? As far as I know, the only library that does have separate code paths would be jQuery but that isn't used *in* the renderer itself and is just used to handle mouse events and retrieve values from the input elements before rendering. All this work turned out to be a big help even though I don't understand anything about debugging SpiderMonkey. I found the exact line that causes the out of memory problem. Commenting that one line caused the renderer to finish with a roughly constant, though comparatively high, memory use. I could even see the GC kicking in and freeing 50-100mb of temporary objects every few seconds. Reloading the page after the render was complete freed lots of memory. I can't even begin to understand *Why* this particular line is causing so many problems for the GC. What I do know is that the array is filled in tile-order (the tiles are 16x16). This means that in an image with 800x800 pixels, the array offset at 12,015 (the lower-right corner of the first tile) will be filled just before the array offset at  16 (the upper-left corner of the second tile). I don't think the order actually matters too much, though. I tried pre-allocating the array but that didn't help. I tried simply pushing elements into the array just to see if the order was the culprit but that didn't help much (if at all). I have been unable to reproduce the problem in any stripped-down test case but I am way out of my depth! What happens if you leave the "new Flog.RayTracer.SampleBuffer( color, 1 );" part but just don't put it in the array? How big is this array getting? How many of these arrays are around? > What happens if you leave the "new Flog.RayTracer.SampleBuffer( color, 1 );"
> part but just don't put it in the array? In JS Shell, the memory usage with that line peaked at ~1.7gb. With that one line commented out the memory usage peaked at ~109mb. > How big is this array getting? It eventually gets to (width * height) elements. In order to account for the memory delta above, each element would be consuming just shy of 2.5kb. The elements are an object (SampleBuffer) that contains a number and an object reference. That other object (Color) contains just three numbers. > How many of these arrays are around? Added stand-alone test cases for both JS Shell and Firefox. SpiderMonkey handles making lots of throw-away objects just fine and handles making fairly large arrays (640k elements) just fine. But filling a large array *while* making tons of throw-away objects seems to block the GC. I looked at the memory usage of the original test case, and there is indeed a ton of fragmentation. Most arenas have only one object in them (with the remaining ~150 cells remaining empty). Looking at the shell test case shows why. It allocates a long-lived object followed by 200 short-lived objects, and then repeats. The long-lived object ends up in the same arena as the short-lived objects. Once they die, the entire arena is wasted except for the one long-lived object. Generational or compacting collection would fix this. I'm not sure what the other engines do here to get around this problem. Chrome uses generational collection, but I didn't think Safari was doing that yet. I don't know what IE does. Thanks for the test case, Jon-Carlos. We're working on adding generational and compacting collection. Unfortunately, I don't think there's much we can do here in the short term. I can give advice about how to work around the issue, if that's helpful. > I'm not sure what the other engines do here to get around this problem. Well, if we gc'ed more often, that would bound the amount of memory we waste, right? > > I'm not sure what the other engines do here to get around this problem. A good approach/fix would be a non-linear memory increase function. We might also include the frequency of GC calls in the function. So if we already use a lot of memory, don't increase the heap by 3x, just by 1.5x or even less. If the last GC was 4 seconds ago, don't increase the heap at all. I hacked a first version of some non-linear behavior. We definitely have to make it nice and tunable but could you give this patch a try and see what happens? You can also play with the numbers if you want. Nice! Some interesting results. The new code was triggered quite often (every 5 - 8 seconds). There is a performance hit. In the few tests I did, it ranges from 5%-12%. 2.76% in 7.4 seconds @ 12542 rays/second. HIGH FREQUENCY GC 64073728, 3.000000! 2.88% in 8.2 seconds @ 12182 rays/second. 3.08% in 9.1 seconds @ 12358 rays/second. HIGH FREQUENCY GC 72155136, 3.000000! 3.28% in 10.0 seconds @ 12466 rays/second. HIGH FREQUENCY GC 96567296, 3.000000! 94.76% in 289.5 seconds @ 14603 rays/second. 94.96% in 290.3 seconds @ 14607 rays/second. 95.12% in 291.2 seconds @ 14603 rays/second. 95.32% in 292.2 seconds @ 14603 rays/second. 95.48% in 293.5 seconds @ 14574 rays/second. 96.48% in 294.6 seconds @ 14648 rays/second. 96.72% in 295.6 seconds @ 14656 rays/second. 96.92% in 296.5 seconds @ 14658 rays/second. 97.08% in 297.4 seconds @ 14653 rays/second. 97.28% in 298.4 seconds @ 14652 rays/second. HIGH FREQUENCY GC 517435392, 1.500000! 97.40% in 300.2 seconds @ 14589 rays/second. 97.92% in 301.2 seconds @ 14618 rays/second. Added some tunable parameters to the Gregor's patch and the gcHeapGrowthFactor varies smoothly over the range controlled by the parameters instead of in a few discrete steps. With the current parameters, the performance is about the same (sometimes a little worse and sometimes a little better) than the last patch. > issue, if that's helpful. I still wonder why we're holding on to ~256MB of non-function objects even after rendering has finished (and after minimizing memory usage with about:memory), where Chrome isn't ever exceeding 166MB. Is that caused by a less efficient representation of the objects, or are we holding on to more objects than they do? > (every 5 - 8 seconds). Right that's a bug in my hack. We also have to adapt the trigger logic in MaybeGC. Currently we trigger a GC in MaybeGC if we have reached the 75% mark of the max-trigger. This doesn't work any more when we reduce the heap-growth-factor and we end up triggering 2 GCs in a row. > > (every 5 - 8 seconds). > heap-growth-factor and we end up triggering 2 GCs in a row. The results look good so far. Is this going to work if you just adapt the trigger logic to the new growth factor? > > > (every 5 - 8 seconds). > > heap-growth-factor and we end up triggering 2 GCs in a row. > trigger logic to the new growth factor? I was playing a lot with this code and fixed some more problems. The results look pretty promising. I can reduce the heap size for some animations up to a factor 2 or 3. The problem now is that our trigger logic has to be adapted to a much higher GC frequency. So for example we already allocate half the heap size again during the time we spend incremental marking and background sweeping. The heap growth factor depends on the heap size after a GC and the GC frequency. For low frequency GCs (more than 3sec between GCs) we let the heap grow to 150%. For high frequency GCs we let the heap grow depending on the heap size. Gregor: is this ready for review? Do you need to do more measurement? I like the growth factor changes in this patch. However, I don't like the slice time changes. For example, my browser does a GC about every 2.5 seconds during the V8 spinning balls benchmark. If we increase the slice time to 30ms there, then there's almost no point in doing incremental GC at all. I'd prefer an approach that increased the slice time based on how many slices we've done so far. I think this code would be cleaner if you converted lastBytes to megabytes at the beginning. It's very important that GCs in the shell be deterministic. We'll need a way for the browser to opt into this mode. For the shell, it seems like high frequency GCs are closest to our current behavior, so maybe that could be the default. JS_MIN/JS_MAX might be useful here? Or maybe the slice time could be based on the number of bytes allocated. > Gregor: is this ready for review? Do you need to do more measurement? Thanks Bill! I will update the patch today. I wanted to get some feedback before proceeding here. So it seems that we agree on the basic heuristic and the requested changes won't change the heuristics. We should continue with more testing. For the slice time: This is very device dependent and we need a more dynamic approach. For B2G for example I saw that GCs take up to 2-3 sec for a 15MB heap(total time and not peak pause time) when the device is otherwise idle. But we should move the dynamic slice time to another bug. Both issues are related since less heap growth leads to more GCs. For high allocation situations we trigger a new GC during the previous GC is still in the marking phase and we end up with a very long reset pause time. > the marking phase and we end up with a very long reset pause time. Another thing we could try is to make the GC slices closer together. Normally we do a slice either when a paint occurs or, as a fallback, 100ms after the previous slice. I always thought 100ms was too long, but I was afraid that if I made it shorter then we might double up (i.e., have a slice because of the timer, and then another slice right after when we paint). However, I think we could avoid this by saving a little bit more state and avoiding the paint GC if a slice just happened. Anyway, if we could change the 100ms timer to, say, a 50ms timer, then we would be doubling the amount of GC work being done in the same period of time. And we would still have about 35ms to respond to user events after each slice. I made all the parameters tunable via about:config. The slice time increase is now only 2x for high frequency GCs but we definitely need to tune this more in another bug. Please ignore the REMOVE lines but this is useful if other people want to test it. I will remove them when landing. Thanks, Gregor. Can we do one more round? It seems like there's a lot of boilerplate here. Could you pass the parameter (e.g., JSGC_HIGH_FREQUENCY_TIME_LIMIT) in as the aClosure param (casting it to a void*) and just have one function? I think this should be initialized to false so that the shell doesn't do dynamic heap growth. "GCs less than this far apart in time will be considered 'high-frequency GCs'. See setGCLastBytes in jsgc.cpp." The rest of these should end with a period. "If false, the heap growth factor is fixed at 3. If true, it is determined based on whether GCs are high- or low- frequency." "If true, high-frequency GCs will use a longer mark slice." Maybe call this gcHighFrequencyLowLimitBytes (and see my later comment about bytes/megabytes). Multiplier seems more colloquial to me than multiplicator. > +     * The heap growth factor depends on the heap size after a GC and the GC frequency. > +     * For low frequency GCs (more than 3sec between GCs) we let the heap grow to 150%. > +     * For high frequency GCs we let the heap grow depending on the heap size. I realized that, for everything except this code, we store sizes in bytes. So maybe it would be better to have JS_Get/SetGCParameter to convert from megabytes to bytes and then remove this conversion on lastBytes. Shouldn't this be 100.0, not 100? However, I have an idea. For the parameters that you divide by 100, I think it would be cleaner to store them in JSRuntime as doubles and to convert them in JS_Get/SetGCParameter. We should probably handle this being false, since these are preferences. I think we usually would call this |now|. Instead of 1000, please use PRMJ_USEC_PER_MSEC. js::Min and js::Max are a little shinier. Could you store the budget in a variable and then pass it into Collect? Do we have a way to set this to false on desktop? > Thanks, Gregor. Can we do one more round? > Do we have a way to set this to false on desktop? I changed it now to 20msec instead of 10. Do you think this is still too much? I changed the values now from MB to bytes but I am seeing some precision problems with division in corner cases. So I am not using the JS_MIN and JS_MAX approach any more. I think this should be moved outside of the else block so that it's always set for high-frequency GCs. > set for high-frequency GCs.